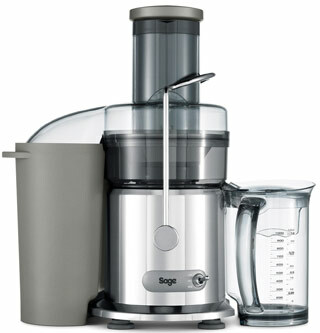 Is The Sage by Heston Blumenthal the Nutri Juicer As Beneficial As It Is Clever? The dual-speed Sage by Heston Blumenthal the Nutri Juicer is designed to use tough blades, a powerful motor and a clever design to get the most out of fruit with the minimal effort, which is exactly what consumers want, but it is the details of this clever design and the nutritional aspect that really stands out. Allegedly, this machine can extract up to 70% of the nutrients from whatever is added to it and uses Italian made filter baskets with 40,000 tiny pores to produce 30% more juice. Does this design actually lead to lots of great tasting produce or it is overselling itself? What benefits have buyers experienced with this Sage Heston Blumenthal Fruit Juicer? The quality and taste of the produce created is just one of the many benefits highlighted in user reviews. The most important advantages mentioned are the ease of use and the machine’s ability to handle a great range of fruits and vegetables. Users can put anything they like into this juice thanks to its extra large 84mm chute, the “long lasting” titanium blades are strong enough to chop and process almost anything that is thrown down the chute and the resulting quantities of juice are impressive when compared to some masticating juicers. Additionally, this Sage Nutri Juicer is also considered to be a good looking machine that can stay out on the counter permanently, which is great considering the amount of time that many buyers seem to spend using it, with many people saying it has become a regular part of their day and they are no longer buying carton drinks. As with all products, there are one or two aspects where users give conflicting opinions or advice and this can be seen with the Nutri Juicers speed and noise level. On the whole, most buyers feel that this is a fast machine but there are some that suggest processing the pulp a second time to be sure of getting all the juice out. Whether or not this machine is quiet or noisy is perhaps relative to the user’s experience with these types of machines and personal expectations; some say it is quieter than other brands they have tried while others expected it to be quieter. It it worth remembering this this model does have a 1200W motor, so there is plenty of power behind the processes to potentially make this noise. Aside from the queries over speed and noise, does this Sage by Heston Blumenthal Nutri Juicer have any clear disadvantages? There is a definite trend with the reviews of this machine where many of the same benefits are brought up again and again and most of the criticisms tend to revolve around one particular subject – the cleaning. Sage say “simply take to the sink after use and rinse the parts under the tap” but, as many reviewers have pointed out, this is easier said than done. It can actually be very fiddly to get all the leftovers out of every component and this is not helped by the fact that not all the parts are dishwasher safe. Having said this, there is praise for the idea of including the external pulp collection basket, as it does reduce the chore to a degree, and it does come with a cleaning brush. Other negative comments are seen much less frequently, such as complaints about faulty merchandise or injuries. There is the odd flawed example that slips through quality control, with some users mentioning leaks, but this is rare. As for the report of cut fingers from the sharp edges on the chute, these edges actually turn out to be part of a slightly ironic safety feature to prevent people putting fingers in the machine and injuring themselves. Summary: is this Sage Nutri Juicer still recommendable despite the cleaning issue? There is no getting away from the fact that this product is a pain to clean out, despite Sage’s attempts to defend the design and reinforce the idea of easy rinsing in the sink. For some, this will understandably be too big a hassle, especially if you only looking to make the occasional glass of juice; however, those that will use this on a regularly basis should find that the effort of cleaning is worthwhile given the amount of juice that can be produced and the minimal effort needed to create it in the first place – you may be cleaning more but you will be chopping less. Essentially, this Sage fruit juicer is still highly recommendable because this cleaning process is the only major flaw in a machine that can consistently produce great tasting drinks with relative speed and great ease and has become a reliable, permanent fixture in many kitchens. Find more customer reviews about the Sage by Heston Blumenthal the Nutri Juicer on Amazon here.